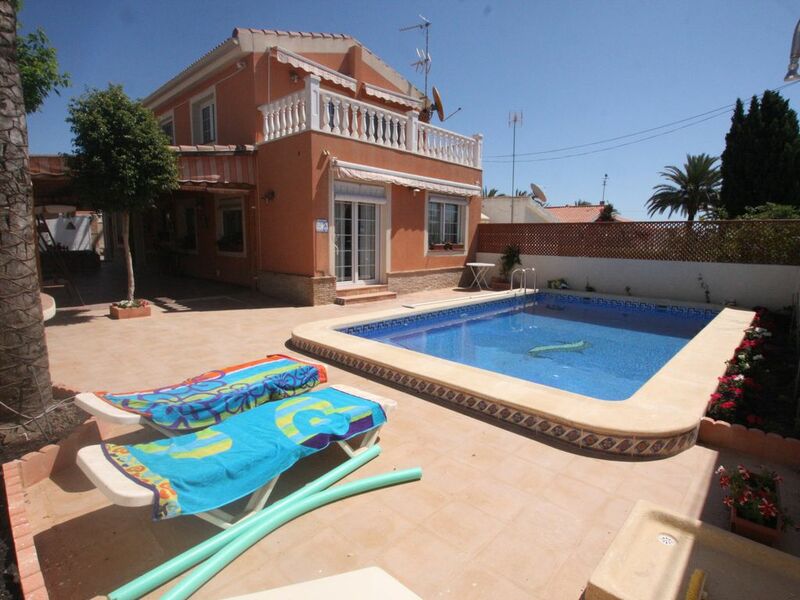 Fantastic 3 Bedroom 3 Bathroom Villa located close to Torrevieja Town Centre and just a 7 minutes walk to the Sea front and Los Locos Beach. The villa is located on a quite residential road and within easy walking distance of local restaurants bars shops supermarkets etc. Inside there is a fantastic living area filled with Light and 5 meter High ceilings, Modern kitchen with all main aplliances including dishwasher, 3 Bedrooms (2 Doubles both with Private Bathrooms and Terraces plus a Twin bedroom and family bathroom, the villa has Air-conditioning throughout and a European satellite system (some English speaking channels). DVD player, Music system, upstairs is a second large living area with Seating, selection of reading books, plus wireless internet access and free wifi. Outside is a large shaded Terrace with seating and dining areas and a BBQ. At the rear of the house is a private swimming pool, 4 Sun Beds, poolside Table and Chairs. The villa has parking for 3 cars. Two baths en suite with showers, 1 bath with bathtub and shower. Great villa, great villa owner! We were met on arrival at the villa by the owner who welcomed us then showed us around the villa. The villa was clean, tidy and felt like home straight away. The pool was also clean and well used by us throughout our holiday. The rooms were spacious, beds comfy and everything in the kitchen we needed. There was a lovely outdoor shaded area where we ate at the big dining table. We were a family of 6 adults and one child and all agreed that the villa was great and Mikel was the perfect host. We had a great time not far to the beach, very clean and the pool yard was a sun trap all day. The owner was great as well. We had our grandchildren over for a short while and they loved it. The beds were very comfortable. We are a family of 7 and we had an amazing time here. The house is huge and spacious and it was clean on arrival and felt like home straight away. We used the log fire every night and cooked all the time saving us so much money on eating out. The only issue I had was that the pool was dirty and not cleaned so we were it able to use it atall during our 10days. This was not advertised or told to us that the pool would be closed so I had 3 very upset teenagers and this was very sad for us. The owner assumed we wouldn't want to use it as it was winter. However it was 23 degrees and teenagers are brave and would of jumped in everyday. Instead they went in the sea but we couldn't go everyday as my parents in law wernt good at walking too far. The pool for us had many reasons for the family so it was a spoiler. Saying all this I could not fault anything else. Four adults and a baby in our party. We had everything we wanted in this house that was comfortable and provided all we needed. The bedrooms we spacious and well furnished, plenty of hangers in the wardrobes. The kitchen had plenty of crockery, cutlery and other kitchen equipment. We used the juicer every day to have fresh orange juice. The pool was nice and well used while we were staying. Plenty of bed linen and towels provided and we could use the washing machine when needed. Nice outside area with a lovely covered and well furnished area to sit and eat. Mikel, the owner was very helpful and even took me to get a small shop as we arrived late. Nothing too much trouble. The travel cot provided did not go up properly and Mikel got us a new cot the next day. A 7/10 minute walk to the quiet beach with a few bars and restaurants. A further 10 minutes walk took us into the main part of Torrevieja. We had a car and we found it useful for shopping and travelling to other parts of the coast, which we found enjoyable. Fabulous villa and fantastic pool , we loved everything . Very spacious , we were a family of 7 staying for 2 weeks and never had any problems . Fully equipped villa with excellent WiFi . Very quiet and private . Our host Miguel was just lovely and I wouldn't hesitate to recommend his villa for a relaxing holiday . Absolutely brilliant. Villa was superb, Miguel was a fantastic host, showing us around, where local supermarkets were and such. Loved the place, never wanted to go home. Andy, Claire, Connor, Kathleen and John. The Costa Blanca gets its name from its many beautiful white beaches. The climate is warm during spring and autumn and hot during the summer months. Winter is also a wonderful time for walking, cycling and horse riding although on many days you can still sunbath at midday. The Villa is located on Av de las Gaviotas 42 in Urbanization Los Angeles, Torrevieja its a Quiet residential road close to Torrevieja Town Centre and only a 7 minute walk to the Sea front lots of good local restaurants offering all types of cuisine, good bars & cafes shops supermarkets banks etc. Great Location has everything within walking distance – car not needed unless you wish to sight see. The villa has off-street parking. Torrevieja is situated next to the sea in the south of the Valencian Community. It is surrounded by two large natural salt water lagoons that form the well-known 'Salterns of Torrevieja', which are considered to be the second biggest in Europe. Alicante, the provincial capital is about 47 Kms away, and the international airports of El Altet and San Javier are about 35 Kms away. In recent years Torrevieja has become a first-class tourist location, it boasts 360 days of sun a year and an average temperature of 18Â°C. There are many beautiful beaches, squares, walks, parks, gardens and other natural beauty spots, as well as some wonderful historical monuments such as the 'Modernist Casino' which dates from the begining of the century and has a famous hall in the mozarabic style; the 'Recinto de las Eras de la Sal' an open, air theatre. Torrevieja has several beautiful beaches and a long, wide promenade with many cafes and restaurants. A new harbour is nearing completion and a new pier taking you about a mile out to see has recently been opened. Torrevieja is surrounded by two large natural salt water lagoons. It is said to be good for sufferers of arthritis, asthma and rheumatism and the area is regarded by the World Health Organisation as having the healthiest climate in Europe. Torrevieja with its beaches carrying the European Blue Flag has many local attractions including an aqua park (open summer months only), bowling alley, cinema, casino and sports complex. There are also 13 fine golf courses in a 20 km ratio. There is also an ever-expanding hypermarket complex a 15 minutes stroll away (or 5 minutes in the car) with Carrefour, Aldi, Lidl, MacDonalds and the new Habaneras shopping centre with its numerous shops.